Do you have trouble saying no? Do you often find yourself doing things for others that you wish you weren’t doing? Have you identified yourself as a ‘people pleaser’? If so, you are not alone. 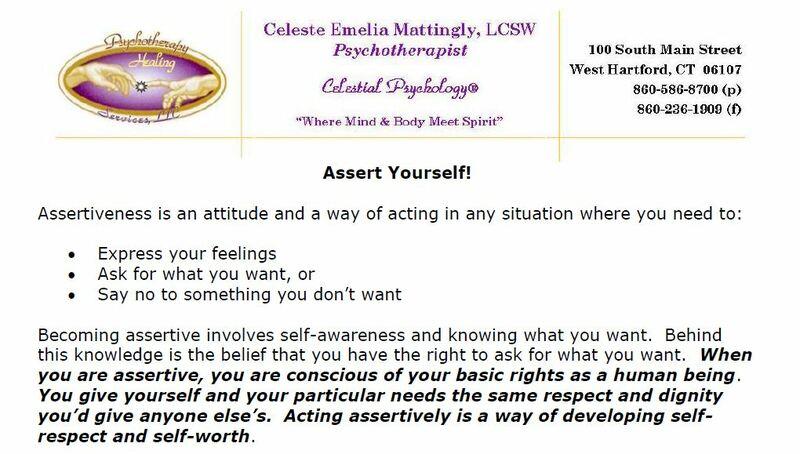 In my work as a psychotherapist the number one handout that folks have been getting over the years is ‘the assertiveness formula’. A few years ago, Dr. Karen Black of Hartford Hospital was listed as a Top 10 Psychiatrist in the Hartford Magazine. She was quoted as saying the most important thing she teaches her clients for their mental health is assertiveness. This formula for expressing ourselves looks simple at first, but it is much harder to incorporate into our daily communication than it looks. I like to suggest writing it out for practice, and to say to folks- ‘I’m practicing my assertiveness formula, so I want to let you know… “This is how I see it…” “This is how it makes me feel…” “This is what I need from you…”. This entry was posted in Celestial Psychology and tagged Assertiveness, Self-Care, Self-esteem. Bookmark the permalink.